Half of my obstacle course. I love working in an obstacle course. I don’t really look at it as a way to totally desensitize my horse, I want him to stay sensitive enough to sense danger, and I don’t want him to so blindly follow me that he’d walk right into danger that I didn’t see and that his senses were deadened to. The reason I like an obstacle course is because it teaches you and your horse to trust each other, it gives you a chance to see how your horse will react under the pressure of the unknown, and it can teach them and give them the opportunity to practice “spooking in place” under controlled circumstances. 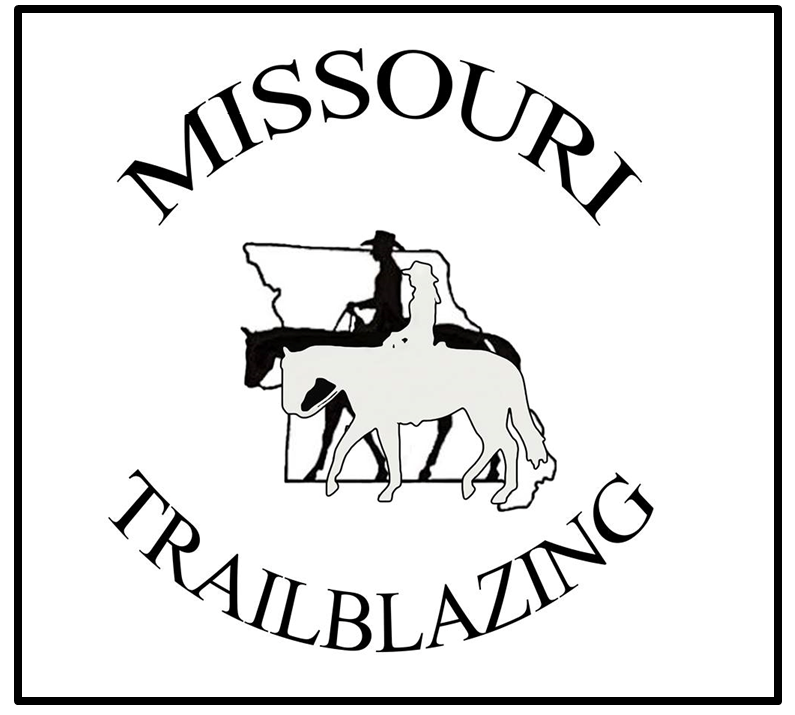 I find them invaluable for training a good trail horse. Not all obstacles in your course have to be complicated or something that has to be built. Some of the best obstacles are things you can buy inexpensively and set around your riding area. Most everything I list here I’ve found at Walmart, Dollar General, or a Dollar Store like Dollar Tree. Used tires are easy to get free. Other things I just had on hand. As always, use common sense when choosing something to use. Make sure it’s safe for you and your horse and that you take the time to train him from the ground before attempting to face it from the saddle. No guarantees but you lessen your chance for accidents that way. water bucket, slicker, or tarp, etc. I bought a child’s western 6 shooter cap gun in the toy department. It makes an excellent obstacle because horses who are not used to gun fire will react to it. It’s obviously safer and cheaper than trying to shoot blanks out of a 22 pistol or something. I did find out the hard way that the old fashioned cap guns that shoot the paper rolls of caps do not work as well as the newer ones that shoot the little round red plastic discs. The old paper rolls misfire a lot and are not nearly as loud as the newer ones. Don’t waste your time or money buying the old fashioned ones…. I took a feed bag, (the plastic woven type, not the paper type) and filled it with several empty soda cans. I closed the open end with a knot, then attached an old lead rope to it. To make it easy to pick up, I put a coat hook on a fence post to hang the lead rope from. This is one obstacle that you definitely want to work your horse from the ground with at first. I’ve seen a couple of horses that didn’t react much to it, and I’ve seen a horse that the owner thought was a dead broke spook-at-nothing horse who gave her rider a rodeo ride because of it. Ashley and Warlock dragging a bag of cans. for them to step through with several stacked up on each side to be more interesting or “decorative”. Lastly, you can take slightly larger than normal sized tires, bury them halfway into the ground, about 2 feet about to be another (more permanent) obstacle to walk through. 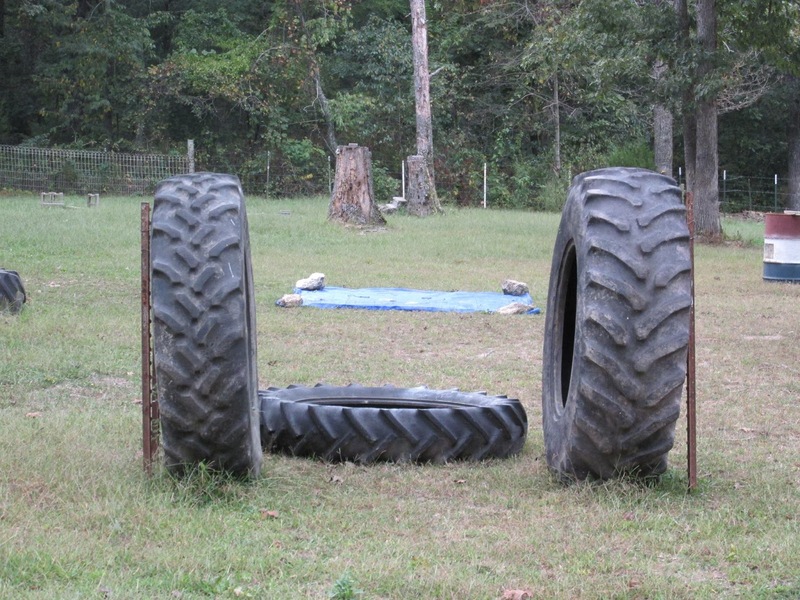 Large Tractor Tires. I use several in different ways in my course. There are several ways you can use trash bags in an obstacle course. They’re not always easy to use all the time, but at some times, they can be wonderful. For windy days, you can take empty shopping bags or small can trash bags and tie them to several fence posts in a row that your horse has to calmly walk past while they are flapping in the wind. In the fall, you can fill regular black yard bags, or those orange pumpkin bags they put out for Halloween, with your fallen leaves. If you only have a couple bags, make them into an obstacle to walk through. If you have a lot of them, you can line them up as a maze to walk through. Lastly, you can take a trash bag filled with various things that you have to pick up from the top of one barrel, walk over to a large trash can, open the can and place the trash bag in the trash can – all while mounted. This is an obstacle for much more advanced horses and riders. Attach balloons to trees in your field, or to fence posts if you have wooden posts. Give the rider a stick made out of a thick dowel rod or a hand-tool handle that has a tack attached to the end of it. The object is to ride to each balloon and pop it while still keeping your horse under control. Another balloon obstacle that isn’t quite so dangerous, but still could be a little bit, is to buy 6 to 12 helium balloons and divide them into two bunches. Either put them on long ribbons and attach them to a little weight at the end, setting them about 3 feet apart, or tie them to another obstacle (like a bridge or Pool Noodle walk through) to make that obstacle more interesting and difficult if your horse has become too bored with it. Great for both of you in the heat of the summer, setting up a sprinkler can be a refreshing obstacle that the kids especially will love. The horse, on the other hand, might not be so impressed. Set one up near the edge of the riding area (nearest to the water hydrant) and just simply make your horse walk through it. Might not be quite as easy as you’d think. Can be laid on the ground to step into, or hung on a fence post to pick up and put over your horse’s head or hindquarters, or can be swung on your arm from the side. When first working your horse with any of these ideas, work from the ground first and move to working from the saddle once your horse is comfortable with it from the ground.